Daughter of Zephaniah Leonard, Esq. of Raynham, Mass. Thy kindred and their graves may be. From which none ever wake to weep." Clarissa is part of a highly regarded, highly documented New England family. And she married into the same when joining with Rev. 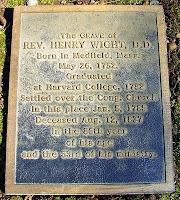 Henry Wight, D.D. in 1799. 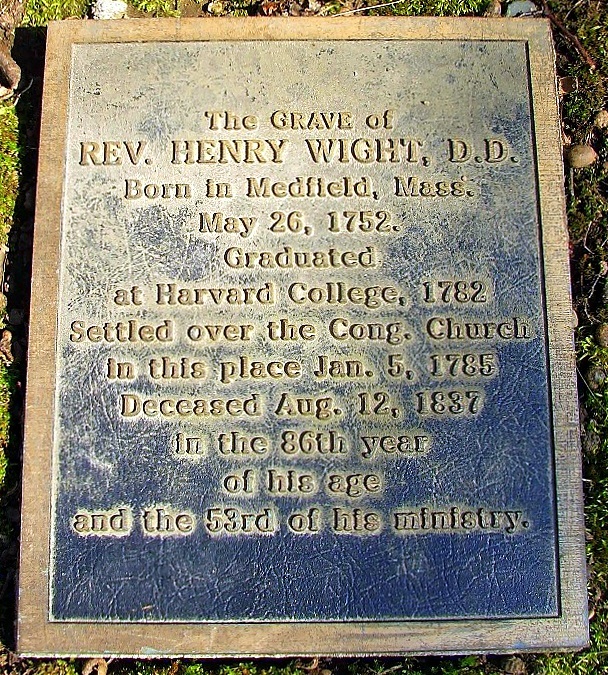 Wight ancestry: Thomas1; Samuel 2, b. Dedham, Mass., Feb 5, 1639, suffered great loss in Philip's war, m. Hannah; Jonathan3, b. Sept 11, 1662, m. Margaret Fairbanks; Jonathan4, b. Oct 11, 1705, m. Sarah Plimpton; Henry5, b. May 26, 1752, of Bristol, R.I.; Rev. Henry6, of Bristol, Congregational clergyman, m. Clarissa Leonard. Ch: 1. Alice, d. 1884, m. Rev. Charles Alden of Providence, R.I. 2. Clara, m. William Rowland of Augusta, Ga. 3. Fanny Leonard Wight, m. Robert Mathis Cleveland. Leonard ancestry: Henry1; Thomas 2; James3; James4; Judge Stephen5, b. Dec 14, 1680, judge of Court of Common Pleas; Maj. Zephaniah6, b. Mar 18, 1704, m. Hannah King; Col. Zephaniah7, Yale 1758, sheriff of Bristol co., d. Apr 11, 1814, m. Oct 30, 1765, Abigail Alden; Clarissa8 m. Henry Wight. 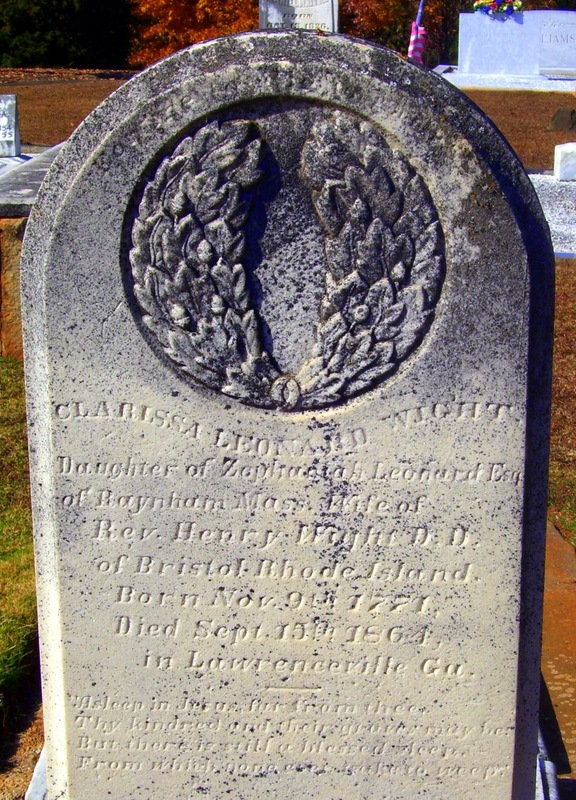 While Clarissa rests in Fairview Presbyterian Church Cemetery at Lawrenceville, her husband Henry was upon his death in 1837 laid many miles away in the Juniper Hill Cemetery of Bristol, Rhode Island. Thy kindred and their graves may be."